We were eating dinner in our favourite restaurant last night. Unusually the television was switched on, I think for the first time as I had never even noticed it before, and it was tuned to the news. I had my back to the TV but Ploy gave me a running commentary of the theft from a gold shop complete with CCTV footage of the perpetrators running from the shop to their bikes, all armed with what appeared to be some serious looking weaponry. The gold shop was in Phrachuap Khiri Khan, an otherwise sleepy town south of Hua Hin, and from my TV eye view of the restaurant I could see other customers were as shocked as Ploy. These events are relatively rare here, certainly away from the usual tourist areas which tend to encourage more extreme alcohol generated crime. But I seem to be hearing more of these events on the news. Ploy told me we had to lock our gate and door at night now as there has been some burglaries in our area, mostly opportunistic it seems. I have no understanding of the psychology behind these acts, whether they are born of true desperation or just bored youths, but both are probably caused by the feeling of futility, that we are just pawns that cannot change our situation no matter how hard we work or how well we live our lives. Thailand has a less fractured family structure than the West. Society as a whole takes care to discipline children; there is no stigma as there is in the West about reprimanding a child not of your loins, for bad behaviour. The police parade perpetrators of crime in front of the TV cameras, heads suitably cowed, the shame being seen as worse than the sentence. But that is changing and changing fast. I remember seeing my first graffiti in Japan and my Japanese colleague shrugged when I commented on it; 'things are changing here too, and not for the better'. The news today seems to be only of one subject: people's greed. And greed that goes unpunished. Here we have ministers that mysteriously have millions of baht in cash stacked in their house. In the UK and soon elsewhere, we have banks doing personal deals with buddies to line both their pockets, and at the expense of individuals and small companies. The people will go unpunished, and even in the unlikely event of them 'resigning' they still have a couple of a hundred million embezzled dollars to fall back on. Whole countries that would be declared bankrupt if they were companies or individuals, continue to be bailed out by others - there are no consequences for playing games with other's money for your own gains. For playing with other's lives. Spending within your means, as most have to do, seems to be a sign of weakness and stupidity. Despite this economic collapse we still hear of only one remedy, a return to growth. But as any engineer or biologist or chemist or physicist will tell you, continual growth is unsustainable. This is especially the case in a small closed system like the earth and whilst we (mankind) briefly tried to extend our disastrous ethics to other planets we have now curtailed that. So earth is all we have. Any attempt to illustrate the consequences of continued growth are ignored, as in the climate change deniers which appear to include most governments and major companies. Something we can change, a man-made construct such as our economic system, is deemed unchangeable, and something we cannot change, such as the climate, is expected to adapt to us of its own accord and in our favour. At about this time, Voyager One spacecraft is leaving our solar system after a 35 year journey of 11 billion miles. It is not expected to meet another object until a relatively close encounter with a red dwarf, Ross 248, in about 40,000 years time. This despite traveling at the brisk pace of 500,000 miles per hour. 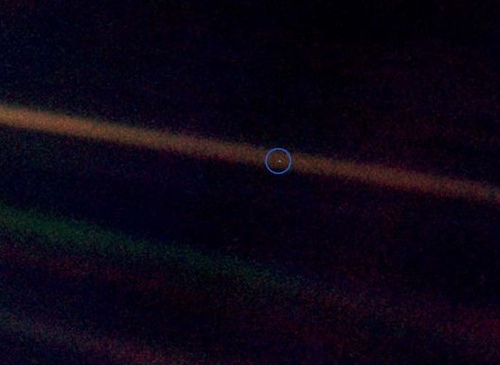 The last photograph the Voyager took was a look back at the earth, then 'just' 4 billion miles away. "That's home. Think of the rivers of blood spilled by generals and emperors so that, in glory and triumph, they could become the momentary masters of a fraction of a dot." 'Our masters now are the rich, the monied, shown to be corrupt and morally bankrupt but who have so emasculated us that we can only write 'disgusted from Tunbridge Wells' comments on newspaper blogs. (And the Middle East 'spring uprising', by changing one corrupt dictator with a democratically elected group of corrupt ministers, is not the change that is necessary). Masters that hurtle us towards oblivion without any seeming concept of their own mortality. Masters that disenfranchise the majority, leading to that sense of futility that, in turn, engenders desperate acts. The Astronomer Royal, Martin Rees, has stated that he thinks the chance of mankind surviving beyond the end of this century is only 50:50. With each day that passes, those odds look increasingly optimistic. On Voyager one is a plaque which, controversially, contains details of the location of our planet; apparently some thought it would give the aliens discovering it the information needed to find and destroy us. Unless they are quick about it they will be too late.